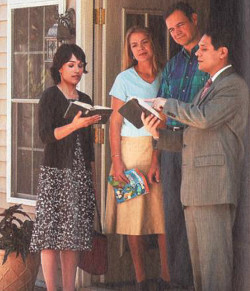 The one thing Jehovah’s Witnesses are best known for is their door to door preaching work. But have you ever wondered what it’s like knocking on doors and telling some poor householder that his religion of choice is nothing more than demon inspired lies? People don’t give you as many hugs for this as you might think. For those of you whose knuckles aren’t covered in thick calluses from knocking on doors, here’s the inside scoop on what goes on behind the scenes. I’ll tell you what they do, how they do it, and why. Helpful Hint: Check that peephole before you answer that knock at your door. Especially on a Saturday or a Sunday. You’ll be glad you did. The area around a Kingdom Hall is divided into territories. Each territory is usually laid out on a map and will come with notes attached to it, like, “That guy on 7th street tried to kill me with a frying pan when I knocked on his door. Best of luck.” The assignment of territories will vary somewhat from one congregation to the next. It depends on the size of the area being divided up and the number of Witnesses attending the Kingdom Hall. Note that all Jehovah’s Witnesses are required to participate in the door to door preaching work if they want to live through Armageddon. Most Witnesses who want to go out preaching on any given week will gather at their local Kingdom Hall on a Saturday morning or a Sunday afternoon. Then they’ll spend some time figuring out who’s riding in whose car, and so forth, before they leave. A group of Witnesses who ride together is called a car group. Every car group will probably have at least one Witness who has been assigned a territory in it. That way, the territory can be worked by the car group. Before everyone leaves the Hall, the senior ranking male will say a prayer. If there isn’t a guy around, they’ll make a sister put a book on her head so she can say a prayer. Remember, sister’s aren’t supposed to take leadership roles unless they have a head covering of some sort. This means that any sister arriving with a hat on her head will probably be the one to say a prayer if push comes to shove, because balancing a book on your head while saying a prayer is pretty undignified. Then everybody drives away so they can start bothering people. No, I meant preaching at people. Yeah, that’s what I said. Of course, Witnesses don’t have to meet at the Kingdom Hall or preach during any particular set of hours. They don’t even have to meet at the Kingdom Hall if they don’t want to. Sometimes, overachievers will go out at night when they’re more likely to catch you at home. In some areas, they’ll even gather in parking lots and try stopping people who are innocently placing groceries in their car. Again, they don’t get as many hugs for this as you might expect. Jehovah’s Witnesses are always counting the hours they spend preaching to others. It doesn’t matter if they’re knocking on doors in field service (that’s what they call the door to door preaching work) or informal witnessing to their colleagues and neighbors. They’re still counting the time and writing it down on a slip of paper like a kid selling candy to raise money for his school baseball team. Witnesses also write down the number of magazines they place with potential converts and the number of Bible studies they’ve conducted with worldly people (worldly people are just awful non-Witnesses like you and me). That paper gets handed in to the preacher’s Book Study Conductor at the end of every month to be counted. Officially, this is done so the Watchtower Society can tabulate the total number of hours spent preaching at the end of each year. Less officially, it’s used as a measuring stick to rate just how spiritual each Witness truly is. More time spent preaching means you love Jesus. Less time means that you make Jesus cry. You can’t see Jesus crying, so your curmudgeonly Book Study Conductor will do if for him when you hand in your time card. Make sure you remember to hand it in. If you don’t, he’ll call you, and then you’ll have to tell him the numbers out loud. This can get awkward if your time spent amounts to just one, or none, hours. To avoid making Jesus sad, most Witnesses have monthly goals they’d like to reach. A common goal is to spend ten hours a month preaching to others. This is harder than it sounds when you have a full-time job, a family to feed, a powerful need to sleep, and five weekly meetings to attend. Not to mention the time you’re supposed to spend studying for each of those meetings in advance. If you don’t have your magazine underlined and scribbled in before the meeting starts, a kindly elder will yell at you for not taking your spiritual food seriously. And no, you can’t ask him why he was looking over your shoulder instead of paying attention to the meeting. That’s disrespectful, and will get you yelled at some more. If a Witness isn’t able to spend a respectable amount of time knocking on doors for the month, he has one more chance to make Jesus clap hands with pride: he can try informal witnessing to make up for the shortfall. Informal witnessing differs from field service because it doesn’t involve dressing up or joining a car group of other Witnesses. It still counts as time on the clock, however, and involves preaching the hell out of any person naïve enough to wander across your path when your time card isn’t looking so good. Preaching to another Witness doesn’t count, by the way. Darn it all. 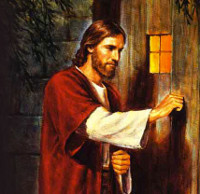 Jesus is knocking! Will you answer? Me neither. There are rules about when you can start your stopwatch and when you have to turn it off. Sure, you can cheat, but Jesus won’t be pleased. Remember, he died horribly for your sins and he’s more than happy to hold that over your head for all of eternity. He’s a lot like your mother-in-law, but a mother-in-law who is as all-seeing as she is all-blaming. The rules have some variations from one Witness to the next, but basically, here’s how the rules for counting time work. Don’t worry. It’s not like it actually works or anything. Nobody wants to be converted while serving lattes at a coffee shop, and most teenagers will try to get away if they can. The kid who’s slow enough to get snagged by an overzealous Witness usually has to mop the bathrooms that night, and nobody wants to be mop boy for the evening. Another thing Witnesses are infamous for is just dropping by someone’s home unannounced in the middle of the day. And no, I’m not talking about field service here. I’m talking about something else. See, if you allow a Witness to give you a free Bible study (fun!) they’ll surely drop by every now and then, without any warning, to waste half an hour of your time. The fact that this is pretty rude isn’t much of a problem for them. In my experience, rude is where many evangelists live. (Sorry. I’m filled with hate and lies.) But why would they do this over and over again? If you remember the rules I told you about earlier (they can’t start their time until they’ve knocked on a door, and they must stop their time at the last door they knocked on) then it’s obvious, really. The Witness was probably in the middle of a long drive while out in field service. They might have been driving to a territory that’s far away or coming back from a territory that’s far away. The point is that they want to count the time they spent driving around, but the rules say they can’t unless they knock on someone’s door before they started the drive and after they ended the drive! If they count the time without doing this, then they are cheating, and that makes Jesus cry. So now they’re going to visit any Bible study who’s reasonably close to their Kingdom Hall so they can count the time they spent driving between places. That allows them to maximize their time card hours for that month. If they knock on your door and you happen to be home, then be prepared to have your afternoon shot to pieces by an unexpected visit. Chances are good that they’ll claim they were “just in the neighborhood,” all casual-like, even though they’re all dressed up in their Sunday best with a bag full of Watchtowers. You might assume this is normal for one of Jehovah’s Witnesses, but no, it really isn’t. You can count on them to read you at least one scripture after some idle chit-chat just so they can legitimately count the time on their card. Why? Unless they read you a scripture or talk religion, they still can’t count the time because they aren’t really preaching to you! That’s why. Warning: they will not leave you alone until they get to read you that scripture. I guarantee it. Try to escape at your own risk. I dare you. Some Witnesses may end up staying the night if you aren’t careful. Is it really worth it? Helpful Hint: If you want to have some fun, let the Witness engage you in a few minutes of idle chit-chat, then suddenly remember an appointment and tell them they have to leave immediately. If they insist on reading you a scripture, tell them that the cops will be there any minute and will arrest anyone found on the premises. Be sure to say this while you throw on your coat and grab your keys. Or you can just make up your own excuse, but remember, the more terrifying, the better. Is There Anything That Will Discourage Jehovah’s Witnesses From Visiting You…Forever? Maybe. (That’s me playing coy.) Stay tuned for another installment soon to come. In the meantime, this isn’t the only article I’ve written about evangelism. I’ve talked about some of the underlying motives for aggressive, no holds barred evangelism at my own web site, not to mention some of the mistakes preachers make when trying to convert others. If you’re as henpecked by door to door preachers as I am, you might want to give some of those a read. Now your thirst for a greater understanding of Jehovah’s Witnesses has finally been sated. And remember, don’t answer that door unless you know who’s on the other side! I have received a couple of comments from ex-Witnesses whose Kingdom Halls didn’t follow all of these practices. This may also interest readers who were never Jehovah’s Witnesses, so I wanted to address those comments here. When I was a Witness, the Watchtower Society often suggested that things were the same everywhere. So, hypothetically, going to a Kingdom Hall in Florida would be the same as going to a Kingdom Hall in California. But this was not, and is not, the case. Besides the obvious reasons for this (customs differ no matter where you go) the local elders wield a great deal of power in their own turf. In fact, the elders at my old Hall would ignore the instructions of the visiting overseers if they chose to and nothing happened to them for it, even if members of the congregation complained to the overseers about it! The Society made up its own set of rules, but that didn’t guarantee that the elders would follow or enforce all of them. Hence, every congregation is a little different in how it applies the rules, especially rules that were merely recommended as guidelines by the Society. Take the rule about knocking on doors before counting your time, for instance. Some Kingdom Halls did not stress this rule, and as a consequence, many of the Witnesses at these Kingdom Halls would not have heard about it. Especially if they were younger Witnesses. Nevertheless, it was part of the Society’s guidelines for counting time. At my old Kingdom Hall, middle-aged to elderly Witnesses had this rule drilled into them from a young age and would only count the time between the first door and the last door. Visiting a Bible study, as I described earlier in this article, was their way of increasing their field service time with a clean conscience because that’s how they were taught to do it. Breaking this rule felt like cheating to them. Many younger Witnesses also counted time this way because their parents taught them to. Other Halls may not have done it this way, but that’s how it was supposed to be done. Also, the article doesn’t say that ten hours of field service was required. It actually says: “To avoid making Jesus sad, most Witnesses have monthly goals they’d like to reach. A common goal is to spend ten hours a month preaching to others.” Ten hours was the recommended goal when I was a Witness, but not a requirement. One hour was required in those days if you didn’t want to be considered inactive. Since then, the Society cut the requirement to just fifteen minutes. Many at my Kingdom Hall still try to get ten hours a month. And yes, our elders would yell at you. I sure got yelled at. My elders were very big on the whole “double honor” principle and would even turn talks about how the elders were to gently shepherd the flock into talks about how the flock should obey the elders in all things. (Good times.) Some of them truly expected you to obey their “counsel” no matter what. If you didn’t, they’d let you have it. If you were (or are) one of Jehovah’s Witnesses, then your mileage at your Kingdom Hall surely varied in all things. I hope this addresses everyone’s concerns or corrections. Thanks. Jehovah’s Witnesses are in *breach of the preach*. So does a guy like me count? I sometimes love to screw with JWs, there is no chance their preaching will work on me and I like to convert the weaker member of the team into a more rational way of thinking. Or am I now on the big board of places to avoid? My home was blacklisted years ago. Even after I moved I still have not seen any. I know there is a huge JW building nearby as well. Your proximity to their building may offer you some protection, abourque. Most JWs don’t preach in their own backyard, though everything past their block is fair game. Unless you work at home, I suspect they simply haven’t caught you at home in a long time. Unless you’ve really done something that triggered their alarms, that is. It can be harder to get on their do not call list than you might think. (That’s what it’s actually called, BTW.) Lots of people try to spook them or weird them out, but they tend to see that as a challenge more than anything else. If you try to chase them away, they’ll probably keep coming around just to prove their worthiness to God. As in, see God, I’m doing what you want even though this person is making it hard for me. In your case, that actually works in your favor since you sound like you want them to come back. However, it may be that average or younger Witnesses will be discouraged from going there, and only those who are more competent at debating will be sent to your home. You could always request a Bible study with them through the mail or even the internet. There’s a link right on their homepage for that. 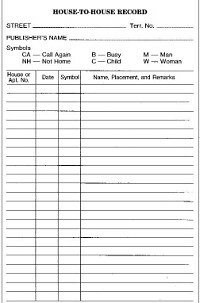 As of last year, the monthly requirement for preaching hours (time card stuff) is 15 MINUTES. Versus the previous requirement of 10 hours. Now they can count “”regular”” publishers in much more generous numbers. Also, congregations in rural areas (where I often found myself) did allow for driving time between remote householder locations. “Corrections” is a bit strong. Yes, for anyone who doesn’t realize this, congregations and individuals vary in their personal adherence in many things. Some congregations are almost liberal by WT standards, though they are looked down on for it by others. It isn’t all as uniform as many Witnesses seem to assume. The elders wield a lot of power within each KH, and just because a person’s KH didn’t follow the guidelines doesn’t mean that the guidelines weren’t there. The 10 hours was never a requirement at my old congregation, either. I never said it was a requirement. It was simply recommended by the Society. One hour, however, was required at my KH, or you would be considered inactive within a couple of months. The rule about knocking on doors isn’t always observed by every person, but again, it was the standard guideline about how you’re SUPPOSED to count time. Again, KHs vary, mostly depending on the attitude of the local elders. Any JWs or former JWs reading articles like this will surely see some differences. PS-There’s a reason why one of Jehovah’s Witnesses, or even a former Witness, chooses to comment anonymously. There are consequences for speaking out against the Society. They don’t deal well with dissent. I can definitely understand their wishes. The admin posted their entry into the comment form anonymously. I normally restrict anonymous posts which is why they probably posted in that fashion. I suggest you edit all your references to “To avoid making Jesus cry…” in your post, and write Jehovah instead. Jesus is not that important to JWs, even though they call themselves christians. Jehovah this.. Jehova that… in their daily conversations they use the name Jehovah for everything, they even inserted the name Jehovah in their own translation of the New Testament, despite the fact that in the original writting in greek is missing. Here in Spain, they are infamous for walking slower than 90 year old granma when preaching. In my experience there are only a few “hard-working” JW who make the most of their preaching time, and the rest the “slow-walkers” who do as less real preaching as possible in the longest time possible. I’ve personally known cases of JW who report 90h a month and when I was preaching with them (when a was a JW, now I’m a atheist) they actually never preached to anyone. These fake preachers only preach if there is an elder or other influential member of the congregation present. Since they seem to be using the name more in general and because they believe Jesus is overseeing their preaching work, which is the topic of the post, I used him as a reference in the article. For those who haven’t read my previous article, Jehovah’s Witnesses don’t believe in the Trinity. They believe that God (Jehovah) is completely a separate person from Jesus Christ. And if you don’w want to be visited by JWs again just say that you are an “apostate”, this works better than saying that you are a Satan worshiper. An Evening with “Brother Sam” creator Roger Scott Jackson. RSVP now!